Special easy tuning harmonica with free online courses and tabs for easier playing blues, pop, rock, country music, reggae, etc. We have prepared 10 online courses, beginner to advanced, and a huge, ever-growing number of tabs. And you can use all that for free! What was it like before the EDharmonica? The Diatonic harmonica (often referred to as the blues harp) was created by a Bohemian instrument maker, Joseph Richter, in 1826, almost 200 years ago, and it was initially designed for playing European folk music. The world has changed since then, a huge number of music genres have emerged, but the harmonica’s tuning system has remained the same. Over time, this lack of change in the tuning has gradually turned the diatonic harmonica into one of the hardest musical instruments in the world to master. 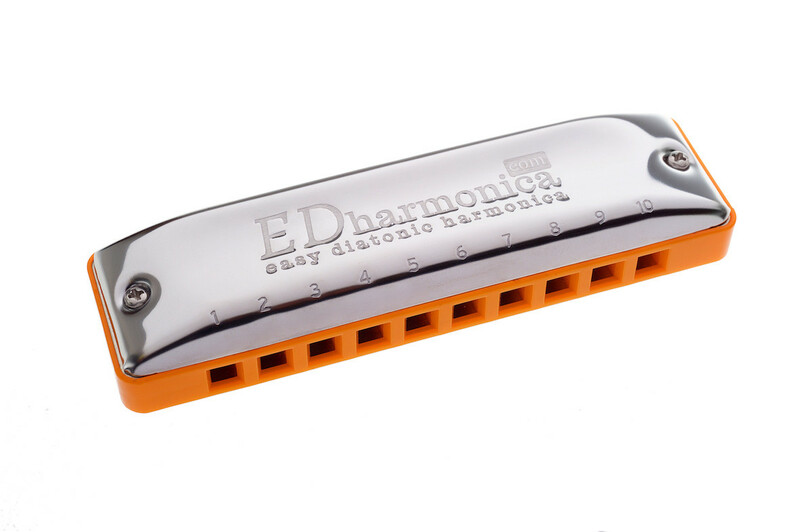 What has changed with the arrival of the EDharmonica? The EDharmonica is the harmonica of the 21st century, designed in accordance with the laws of music and offering musical possibilities to match the spirit of the age. It’s been created specially for an easier and more convenient playing experience in all modern music genres. The EDharmonica enables beginners to achieve quick results and offers extraordinary possibilities to advanced harmonica players. A technique allowing you to play the missing notes on holes 1, 2, 3, 4, and 6 on the draw. A technique allowing you to play the missing notes on holes 8, 9, and 10 on the blow. A technique allowing you to play the missing notes on holes 1, 4, 5, and 6 on the blow. A technique allowing you to play the missing notes on holes 7, 9, and 10 on the draw. Most harmonica players had to practice regularly for years to properly master these techniques and to learn to use them freely. A technique allowing you to bend down practically on every draw hole of the EDharmonica to play additional notes. A technique that allows you to play the two most rarely used notes on the EDharmonica. 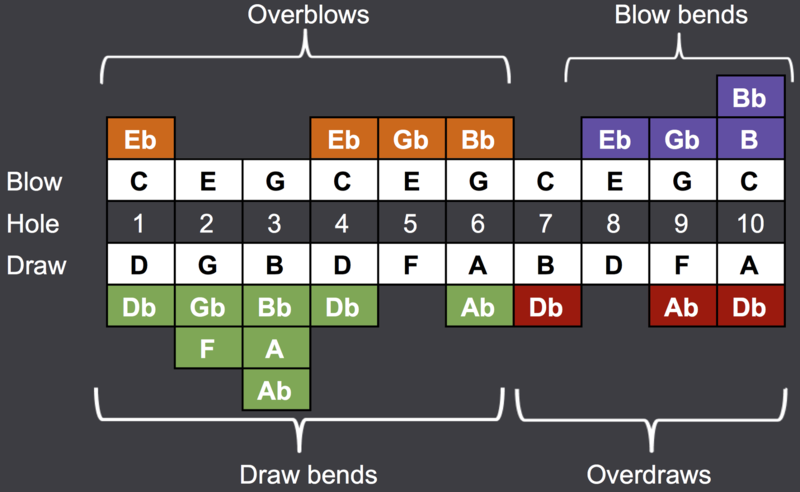 The fact that the most dissonant notes are hidden "behind" the overblows is a very positive feature, as it prevents a musician from accidentally hitting those discordant notes during improvisation. Note layout varied a lot in each of the three octaves on the harmonica which made the entire system too complicated. Even many competent harmonica players could not remember the layouts of different harmonicas, only that of a C harmonica at best. On the EDharmonica, notes are repeated in each octave, as is the case with all popular modern musical instruments. For beginner players the musical possibilities of a diatonic harmonica were very limited. Even when playing apparently simple tunes you often found that some of the notes you needed were annoyingly missing and could only be played by using bends. As a result, beginners had to content themselves with the simplest tunes involving no bends, like Twinkle Twinkle Little Star and Oh Susanna, while improvisation for beginners was more or less impossible without the bending skills. With the arrival of the EDharmonica, a huge number of well-known songs can be played easily. For example, you can now play Ed Sheeran's Shape of You, Eric Clapton's Wonderful Tonight, Coldplay's Yellow, Bon Jovi's It's My Life, U2's With or Without You, the Eagles' Hotel California and many other popular songs without a single bend. What is more, you can even start learning to improvise and play together with other musicians without having the bending skills. The EDharmonica makes all this realistic! And at the same time, you will be able to master your bends properly and at your own pace, gradually unlocking the instrument’s incredible potential. IT IS NOW EASY TO PLAY A HUGE NUMBER OF POPULAR SONGS - AND WITH NO BENDS! To play the diatonic harmonica to the full in different keys you needed notes which could be played only with the help of overblowing and overdrawing. You not only had to spend a lot of time learning those techniques but also quite a bit of money to have the harmonica customized so that it was possible to play them at all. That’s all changed now with the arrival of the EDharmonica. Each EDharmonica lets you play in as many as 8 different keys without overblowing, let alone overdrawing. BLUES IN THE KEY OF E ON A C HARMONICA? EASY! You no longer have to have another EDharmonica to play in the "bluesiest" key of E. It is now very easy and straightforward to play blues in E on an EDharmonica in the key of C (Am). This is now one of the easiest and most convenient blues positions on the EDharmonica. Like to play in the so-called 2nd position? Then imagine having the G note always on the draw side and being able to bend literally on every hole. Great, isn't it? But the truly amazing part is that all "legal" blues notes (notes of the blues scale + the major pentatonic) are laid out in the most convenient way possible: blow - full draw bend - draw, and that is the pattern repeated on every hole! Anyone who likes to play fast will certainly appreciate this. The possibility to play tongue blocked octaves for every single note on an EDharmonica takes tongue blocking blues playing to new heights and the sound sometimes acquires a color pretty much like that of a Hammond organ. Unlike a standard diatonic harmonica, the EDharmonica makes it very convenient to play blues in the so-called 6th position (key of B). 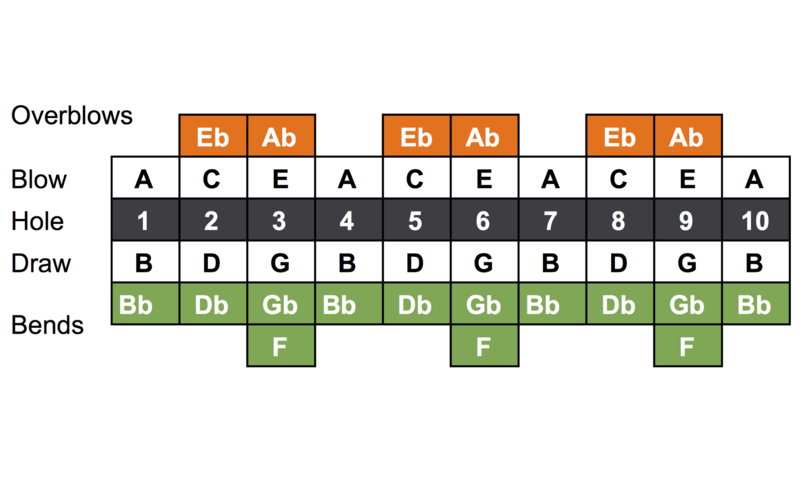 The patterns are very similar to those used for playing blues in the so-called 3rd position on a standard diatonic harmonica. Advanced players will particularly appreciate the ease with which blues can be played in the 6th position. The EDharmonica has the characteristics of a perfect solo instrument: 1) availability of both major (on the draw) and minor (on the blow) chords, 2) the possibility of playing tongue blocked octaves on all holes, 3) the possibility to play double stops (two notes played together) and other interesting intervals. 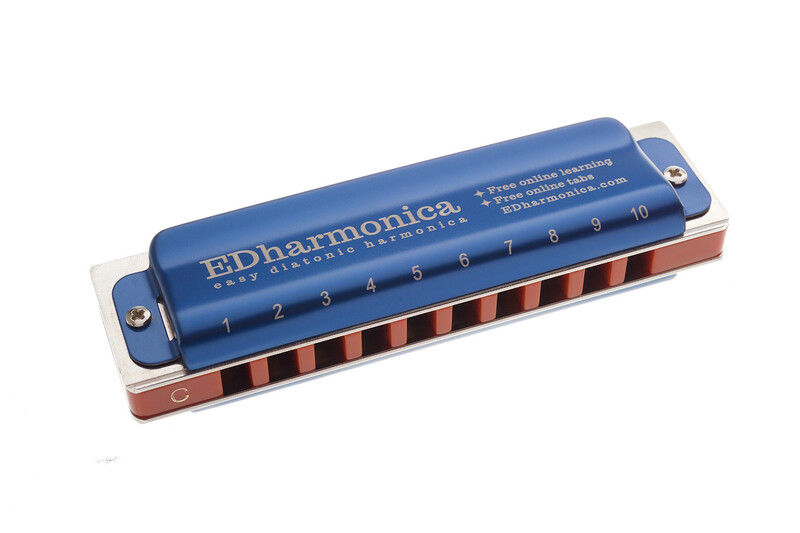 If you enjoy inventing exciting solo rhythms, like to play chugging, folk and popular music, or reggae, or maybe even use some beatboxing in your harmonica playing, and if you prefer doing all that without an accompaniment, then the EDharmonica is perfect for you! It is a modern instrument offering huge possibilities for solo performers.